Some tobacconists are Myki retailers. Should they be? I suppose trains need signals. 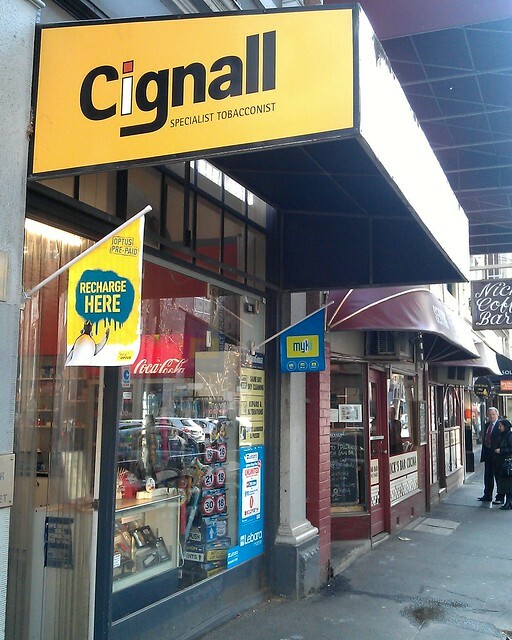 And perhaps it’s another move to make Melbourne more European: this Cignall tobacconist in Queen Street is a Myki retailer. I’m not sure I have a strong opinion on this, but it does seem like an odd match, given smoking is banned on public transport vehicles, is also banned in the undercover areas of stations and stops, and is generally frowned-upon these days. It may give off mixed messages, having a shop whose primary business is selling smoking products also sell Myki cards and do topups. Are the Transport Ticketing Authority and the government really happy with this association? There is a convenience store across the street, and a newsagent a few doors up (the latter open weekdays only I think) that could have served as Myki retailers in the immediate vicinity. As it is, according to the online locator tool, the nearest existing Myki retailers are each half-a-block away: a 7-11 in one direction, and a street kiosk in the other. ← Previous Previous post: What to see in Perth? Looks like they also sell Coke and SIM cards. Perhaps, by selling Myki goods they might be inclined to diversify their business away from cigarettes, and become more of a generalised convenience store. I’m certainly not a smoker, and I support most of the legislative changes that have occurred over the years. But the business is legal, and it is useful for people in the area who are looking for a Myki topup. I don’t think that we need to treat everything related to smoking hysterically. When I was working in Richmond, there was a cigarette seller in Swan st where I could buy a metcard, back when i was using PT infrequently and needed a 10 x 2hr ticket. Unsure if it was a Cignall, and don’t know if they still do sell PT tickets, but similar line. I don’t have a problem in them selling Myki products. Not a fan of smoking but the store proprieter seems to sell lots of different products as well as cigs. Gotta make a living, eh? Personally I’d like to see myki top-ups being processed virtually everywhere phone top ups can be processed. I don’t really care what their primary product is. I don’t think that selling myki cards and top ups there necessarily endorses smoking. I used to sometmes buy my metcard (before I had my myki) from the Railway Hotel in Windsor and I never thought that selling them there encouraged drinking alcohol. It is just a convenient place to sell them and another product for the stores to carry and profit from. It would never occur to me that this could be seen as controversial to others until you brought it up with this post. Speaking of which, if someone did want to become a myki retailer, how would they go about it? Something interesting I noticed: The IGA supermarket opposite Southern Cross Station was a myki retailer when retail topups first became available, but it isn’t any more. I guess when there are two myki machines outside your front door and the myki discovery centre is right across the road, it seemed a bit silly. @Jed, really, the Railway Hotel was a Metcard outlet? Didn’t know that! I wonder if they would have sold Metcards to unaccompanied minors. @Nathan, the theory was the retail network was entirely recast during the switch from Metcard to Myki. They probably signed up 7-11 first, then looked to fill the gaps. In the process, some Metcard retailers got dropped. I should clarify that it is the 24 hour Railway Hotel bottle shop and convenience store that sold them and not the actual hotel bar upstairs. I wouldn’t think that minors would be barred from shopping for the non alcohol items in there. This is a very convenient place to sell them because (as you already know) it is just across the street from Windsor station. I believe they do myki now as well. I think that Bottle shops that are near railway stations should sell myki’s and do top ups as they are open later. I work part time in at a bottle shop in Parkdale and on Sunday when the Tatts is closed people don’t know that you can buy myki from the machine have asked if we sell them enough times that it makes sense. Especially now that they have pulled the metcard machines. Also often having that service will increase sales as well.